Give the Gift of non-toxic ceramics! Give the best that the Blue Ridge Mountains of Virginia have to offer with our unique gift ideas. Let us show you some of the best ways to use and display our handcrafted American pottery with our gift packs that combine select pieces with some of the finest products from our region. Complete bathroom accessories sets, African violet pots, complete non-toxic dinnerware sets, safe dishes for babies or toddler, and exquisite tea sets can all be found right here. Only from Emerson Creek Pottery! All our ceramic pieces are handmade and handpainted at Emerson Creek Pottery in Bedford, VA. All pieces are microwave and dishwasher safe, ovenproof, and always lead free. Our handcrafted, handpainted ceramic bathroom accessories, together in one handsome set. Perfect for brightening and decorating your bathroom. Banish unsightly clutter from your bathroom countertop by organizing with our handpainted bathroom accessories. These handcrafted, matching components make your vanity a thing of beauty and give you just what you need to store your favorite soap or lotion, toothbrushes, hand soap, and more. Set includes: 8 oz. Ceramic Soap Dispenser, 4″ wide Ceramic Soap Dish, 4″ high Ceramic Toothbrush Holder, and our 8 oz. Ceramic Jar. Your family will dine in style with our selection of beautifully handmade ceramic dinner sets. Choose from our selection of handpainted botanical or classic ceramic designs. Each piece is individually handmade, and the made-in-the-USA craftsmanship of our ceramic dinnerware is easily apparent to the eye and to the feel in your hand. Turn your dinner service into something extraordinary with our lovely ceramic dinner set. Our Dinner Set for includes: Dinner Plates, Salad Plates, Dinner Bowls, and either a Tea Cup with the Classic and Coupe sets or a Heritage Mug with the Craftline sets. Our complete dinner sets are available with your choice of our classic plates, coupe plates, or craftline plates with either the Sets for One or the Sets for Four. Protect your children from toxic plastic and dangerous lead with our beautiful, USA-Made ceramic Children’s Dinnerware. Our tableware set for babies and toddlers include a darling baby dish, baby cup and baby bowl, keeping mealtimes safe and healthy. The dangers of toxic plastic are making headlines, and nowhere is this more concerning than when it comes to babies and children. For decades, manufacturers have marketed plastic baby tableware to parents, little suspecting that this could be hazardous to children’s health. Recent scares with imported children’s products have only added to parents’ concerns about the safety of their kids’ tableware. Bring our USA-Made, lead-free, non-toxic ceramic baby dishes to the table and feel sane again about what ought to be the simple, loving action of feeding your little ones! 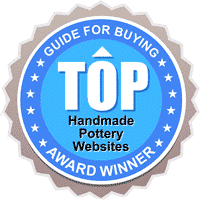 We’ve put together our most charming and elegant teaware in one set, all individually handmade here at our Bedford, VA pottery, and offer it to you at a lower price than if you collected these pieces individually. Don’t settle for toxic factory imports when your tea service can have so much more! Our ceramic teaware is not only made right here in the USA, it’s handcrafted from non-toxic, lead-free clay of the beautiful Blue Ridge Mountains of Virginia. All pieces are always 100% safe for use in your oven, microwave and dishwasher and will last you for many years to come. All Ceramic Tea Sets include Teapot, Creamer & Sugar Bowl, Oval Platter and (2) 10 oz. Tea Cups. And we didn’t forget your favorite furry creatures! Do you love our handcrafted ceramic pottery? Well, your pets will, too! Browse our complete line of ceramic dog dishes and cat dishes right here. We are proud to bring you American-made, lead-free pottery since 1977. Emerson Creek Pottery is reaching out to the four-legged members of your family with this beautiful line of safe ceramic pet bowls for your family pets. Made right here in Bedford, Virginia, each dog dish or cat dish can also be personalized with your pet’s name!